Bake Off star Paul Hollywood has spoken of his horror after the winner of this year's series was accidentally revealed by fellow judge Prue Leith. "What can you say"Unfortunately Prue can't be with us as she's too busy deleting her Twitter account," joked presenter Jo Brand.Leith revealed that Sophie Faldo had won on Tuesday morning, hours before the finale was aired.The tweet was hastily deleted, but not before many people had noticed and circulated the gaffe. She said she was in Bhutan and had been confused by the time difference between the UK and the South Asian country. "She was in the Himalayas apparently," said Hollywood on Thursday's edition of Bake Off's sister programme.Brand made a second reference to Leith's error by pretending the writer and restaurateur had been in touch. 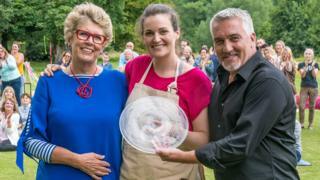 "I've had a text from Prue and apparently the winner [of next year's show] is somebody called Malcolm," she said.Leith's mistake did not stop 7.7 million watching the Bake Off final on Tuesday, earning Channel 4 its highest overnight ratings since 2012.The series was the first to air on Channel 4 following the programme's high-profile switch from BBC One.